Hopefully the rest of the game is better than the start. Raging waters are flooding the village and everything that isn’t wet is on fire. I’m sure famous treasure hunter Lara Croft has escaped from places more on-fire than this, so I leap confidently from one lump of flotsam to another. A big chunk of wall floats past in front of me. As it sails past I think ‘oh was I meant to jump on that?’ but it’s too late. I try the leap anyway and fall into the water, where I am somehow impaled by spikes. The game loads back on the first piece of flotsam. This time I leap at the wall, clamber up onto the raised edge and use it as a narrow path to the next platform. Then I leap onto a mottled patch of wall, textured in a way that lets me know I can use my axe to gain purchase. I start to shimmy right, fall off and get impaled on the same spikes that killed me earlier. Oh, the game wanted me to go left. Third time lucky? I ace the jumpy bit, and the climby bit, but reach a point where the ledge ends next to a big dark window. The wall on the other side of the window looks like ledge to me, or perhaps I’m supposed to go into the window? I leap. Spikes again. I was supposed jump upwards and trigger a cutscene. Shadow of the Tomb Raider will purportedly allow Lara to become an exciting jungle hunter with new exploration spaces, stealth mechanics and refreshed combat, unfortunately there’s very little evidence of this in the first playable section of the game. It feels like an early setup mission, so I expect a degree of linearity, but most of the hour-long demo is one narrow line through a series of tableaus that look beautiful and atmospheric, but leave little room for the player to get involved. You guide Lara through a colourful party to trigger a cutscene. There are underwater sections where Lara struggles through narrow spaces, on the verge of drowning, but all that’s required from you is to mash a button at the right point to dislodge some rock or smash a window. Between the scripted sequences and the poor trial-and-error flood platforming section, there are glimmers of potential. Between the scripted sequences and the poor trial-and-error flood platforming section, there are glimmers of potential. Early on in the demo there is a jumping puzzle arranged around a huge underground pyramid, artfully lit by a beam of sunlight. You have to leap between huge bells attached to a pulley system. Some need to be weighted down or destroyed to raise other bells and form a path to the illuminated temple dais. To reach the final platform you use Lara’s new rappelling ability to hook a line into a climbable surface and scoot down the rope. You get to do some fun swinging and leaping with rappel lines, but aside from this neat addition the rest of the running, jumping and climbing feels identical to the last two games. There is a brief burst of combat in the demo, which also feels very similar to the last two games. You can crouch-dodge around to remain unseen and murder people with a knife when you get close. Lara’s excellent bow is the stealthy ranged option of choice, but you have a pistol, machine gun and shotgun to hand. Stealth will supposedly be a bigger deal in this game, but the only hint of this is a new move that lets Lara press into some vines as camouflage, like Rambo, or Homer Simpson reversing into a bush. It makes stealth routes through the small area seem more varied but, like the rappel ability, doesn't seem like a massive evolution of the system. After that it’s back to more cutscenes. 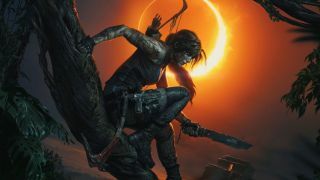 In Shadow of the Tomb Raider Lara Croft has raided one tomb too many and triggered the apocalypse by removing a sacred dagger from its resting place. The sinister Trinity organisation is also hunting for Mayan artifacts in the hope that they can stop the apocalypse Lara has started (cool) and use ancient magic to remake the world (oh no). Lara’s a great hero, and even though she accidentally triggered the end of the world it was in a gung ho adventuring spirit. It’s a nice turnaround from the gruelling suffering of the first of the three Tomb Raider reboots, and I’m genuinely interested to see how Lara will carry the guilt of a tomb raid gone wrong. Exploring a jungle in the middle of an apocalypse could be a seriously good setting too. However if this hour is representative of the rest of the game then go in expecting a linear rollercoaster with some nice views and a score somewhere in the 50s or 60s from PC Gamer. The last two games were much more than that, and it seems likely that Shadow of the Tomb Raider will open up and give us the exploration, intricate puzzles and combat that made the other two games quite good. I can only judge based on what I've seen so far, and dramatic corridors powered by quicktime events don't cut it in 2018.